If you are uncertain please ask or wait for us to send s a combined invoice. M10 Rail mounted Gantry Crane (grading 4). For full details of the grading of our kits please see the appropriate custom page. Picture includes illustration of model when completed. The model contains parts to build one gantry crane, it requires construction and painting. Rail Mounted Gantry cranes (RMG)were first introduced in the 1970's and are still in widespread use today. The RMG travels along fixed rails to lift, transfer and stack 20' to 40' containers using a top lift spreader. Sometimese these have additional drop-arms for more specialised loads (such as box type fixed trailers or swap-bodies). Our model is not a direct copy of any specific make but rather soundly engineered as a reasonable representation of a 45-tonne cpacity crane that will sit happily on any layout set from 1970's to the current time. The kit is designed to be as flexible as possible allowing a variety of spans to be modelled. In its widest form this gives an internal span of 155mm allowing 4 rail tracks and a service road (or 2 rail tracks, service road and 2 high single stack along track side). The Instructions give full details on how to achieve various spans with the narrowest recommended being 90mm (just allowing 2 rail tracks and a service road). 45ft containers can be lifted with spreader set at the 40ft twist-lock location. The track on which the Gantry Crane can run is available as a separate kit. M11 Gantry Crane track starter pack Our design is based on a pre-cast concrete strip with a single recessed rail seated in a series of cast cleats, Each track section has a tongue at one end and recess the other to keep section joints aligned. It can be assumed mains electricity supply would also be incorporated within the pre-cast concrete unit in real life so we have included a small electricity power control building kit. There is also an instruction sign provided to be placed to one end of the track. The starter kit includes sufficient track to produce a 255mm double rail-track and also includeds the same legth of security barrier to protect rhe overhanging walkway on one end of the crane. We prodeuce more than 420 different models for N Gauge of which more than 100 are available handpainted and finished. You can access this by clicking on the appropriate Category link which can be found on the left hand side of this, and every, listing. For full details see our terms and conditions. 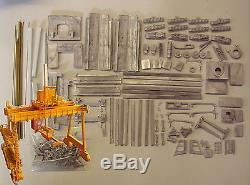 The item "P&D Marsh N Gauge N Scale M10 Rail Mounted Gantry crane kit requires painting" is in sale since Monday, October 3, 2011. This item is in the category "Collectables\Model Railways & Trains\N Gauge\Other N Gauge". The seller is "bluenotebowls" and is located in Wisbech.